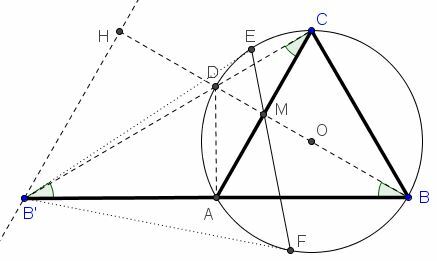 Let $R$ be the radius of $(ABC).$ We have $OM=MD=R/2.$ The polar of point $M$ relative to $(ABC)$ is perpendicular to $OM$ and passes through point $H$ that satisfies $OH\cdot OM=R^2.$ It follows that $OH=2R.$ Since $OM=R/2,$ we also have $HM=3R/2=BM,$ making triangles $BHB'$ and $BMA$ similar (same angle at $B$ and proportional enclosing sides.) 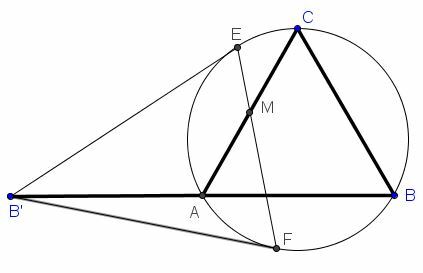 Thus $B'H\perp BH$ and $B'H$ is the polar of point $M.$ By La Hire's theorem, the polar of $B'$ passes through $M$ but this is exactly $EF,$ and the proof is complete. The proof only a slight modification of the one suggested by Machó Bónis at the CutTheKnotMath facebook page.